The Short Screenings is a project of CineShorts Film Appreciation Club where we showcase multiple Indian Short Films on a fortnightly basis. The screenings are followed by an interactive Q&A session with the makers, cast/crew where you get a chance to meet, interact & know more from the people involved in the filming process. Fighting on Ice is not an ordinary sports documentary - it's hard hitting and real - revealing the true fight between passion and Struggle.Fighting on ice follows the life of the team, the association and innumerable passionate people - who believe in the future of ice hockey in India, who believe in themselves and their dreams and who's passion for this sport is beyond the closed doors of the government. Without official support, without funding, without equipment, ice hockey is still surviving - primarily because of this fabulous group of people who are giving it their all - just to make their country proud! It's time India gets to know about these fabulous sportsmen - who's undying spirit and positivity, to put India's name on the game of ice hockey - is something to be proud of! The filming would be followed by a live interaction from the Director himself Mithun Bajaj on his journey filming one of the most unknown games existence in India. 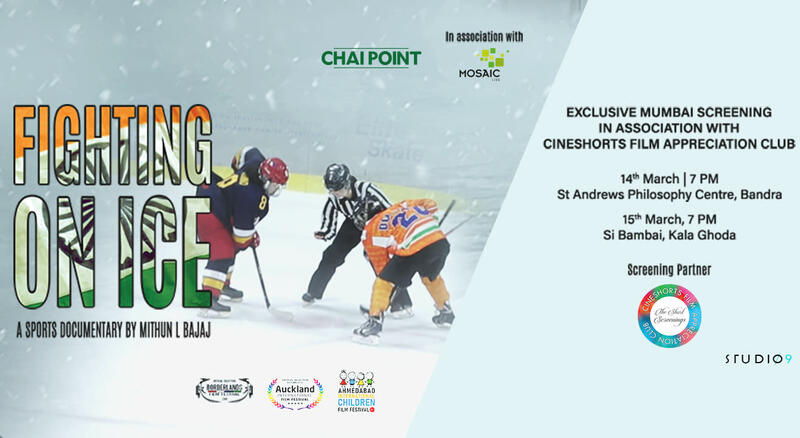 Proud to showcase the very first exclusive screening of India’s first sports documentary to be made on Indian Ice Hockey team in association with CineShorts Film Appreciation Club. The film had it's world premiere at the Madrid Asia international festival where it has been nominated for best documentary and I have been nominated for best director. It has won best documentary at Eurasia international monthly film festival,Russia and has been officially selected for the Rome Independent Prisma Awards, Amsterdam international Filmmaker Festival and the Auckland international Film Festival. The US premiere happened in October at Borderlands Film Festival in El Paso.The Indian premiere happened at the Ahmedabad International Children's film festival and was awarded special jury mention for best documentary. CineShorts Film Appreciation Club is a community service designed for the Creative Minds, Artists & Cinelovers. Stands on the philosophy of MEET.NETWORK.CREATE it aims at building opportunities & connecting people of like minded interests.